I've seen this graphic shared a few times over the last few days. It resonated with me a great deal. I spent far too long trying to shoehorn myself into a life that was practical but not very nourishing and I suffered for it. So, because this graphic reminded me of my own experience I shared it on my social media. Of course, various friends commented on it but one comment was particularly concerning. "It needs one more circle. You're lucky." And I would argue, luck has very little to do with it. Since I started this blog I came to realize my own life philosophy was rooted in Deliberate Living, an idea I co-opted from Thoreau. The premise is that you can't just let life happen to you, you need to make deliberate choices - whatever those choices are - to live the life that fulfills you. I have worked extremely hard since 2009 to get to the point in my life where I am today. There were literally blood, sweat, and tears spent in the building of the tiny house. The tiny house gave me the confidence to quit my day job and start working for myself in 2012. I spend the next three years building my business through a combination of marketing, hard work, and sheer will power. Today I make a comfortable living and love the work I do every day. Saying I was lucky minimizes all of the work I put into what I have built over these years. It suggests that I was merely in the right place at the right time and doesn't account for much more. To say I was lucky allows others to believe in their own excuses and not make whatever life changes they need to do what they've always wanted to do. I would say I am fortunate, but I don't believe that luck and fortune are the same thing. Fortune is when you have something to do with it. I can't tell anyone else how to live their life. All I can do is share my experience. And when I was only focused on "you are paid for it" with a little "your are great at it" (profession) I was slowly dying inside. 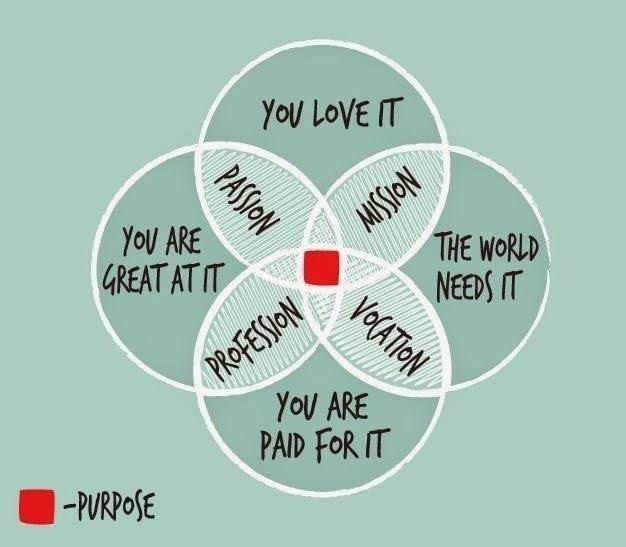 While it was good to be able to pay bills, I had to realize that those bills were self-imposed and what I needed was a catalyst to propel me toward the middle of this diagram. And I think everyone is capable of it - it isn't just about being lucky. You can create your own fortune. So - what would you do if you could do anything? Nothing as in wouldn't do anything differently because I already live a deliberate life. I do not mind at all. I'm glad it resonated with you. Agree 100%! I'm in the midst of creating my own business and 1 1/2 years in have nothing to show for it (externally that is). When I finally configure my business in the way that supports me and fufills my purpose I will not have forgotten the years of sacrifice and dedication it took to get there. Saying people are "lucky" is just a way for some to get out of living up to their full potential. And for those who have seemed to rise quickly if you ask them they will tell you they invested heavily in a mentor/coach/business advisor to get them there quicker. No matter what it is not easy and requires dedication and sacrifice. Thank you for this post, Laura. It is truth! If I could do anything, I would sell my house to travel the world while working on my ideas. There's a time for everything. Admire your choices and how you live. Agree that the worst thing to hear from others is "you're lucky" because it's not that simple to achieve anything. I see what you are saying, but have to disagree in part. I definitely subscribe to the "pull yourself up by your bootstraps, if you don't like your life do something about it" mentality. But I am fundamentally lucky to even be in a place to have those choices. Lucky that I am healthy both physically and mentally. That I found a partner who is supportive of my goals. That I was born into a loving family and raised in a good environment with no trauma in my life so I could focus on just doing what made me happy. Many people are not so lucky and have to deal with health problems, abusive situations, terrible things that happen in life that they have no control over and makes it much harder to be able to live a fulfilling life. As for your last question, I am doing exactly what I want, staying at home with my kids and spending lots of time with my friends =). You are absolutely right. There are some things in our lives over which we have no control. That being said, in the specific context of this conversation (finding your purpose) I don't believe I was lucky in any way beyond the intrinsic things that I can't influence. I worked very hard to get where I am and it saddens me to see so many people with so much potential just follow the path of least resistance because it is easier. I look at graphics like that almost every day and get super motivated, then as I get sucked back into the lifesuck of a cubicle job I have trouble seeing a way...ANY way out. And then I get very motivated by reading about stories like yours and remember that if you want it bad enough, you'll work for it hard enough.